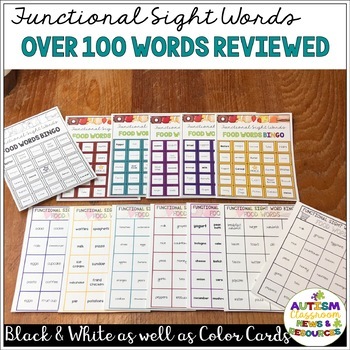 In special education we are always looking for ways to practice functional reading of meaningful environmental print with students in life skills classrooms. 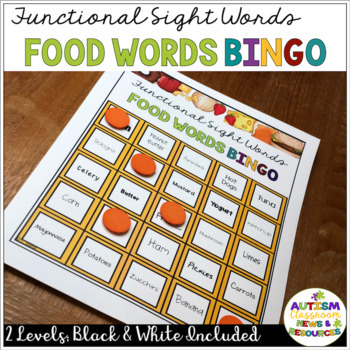 This set of Food Word Reading BINGO cards focus on words found in restaurants, grocery store, fast food places, and in the kitchen. The goal is to have a fun ways to practice reading that helps to build fluency and generalization of words around us. 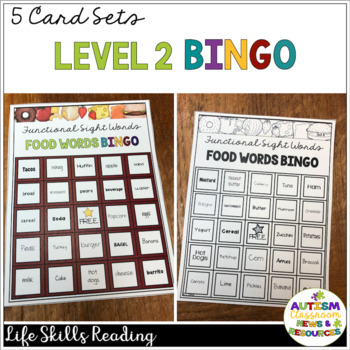 The BINGO Sets are designed to go with my Sight Word Food Task Cards and includes the same words as that set. 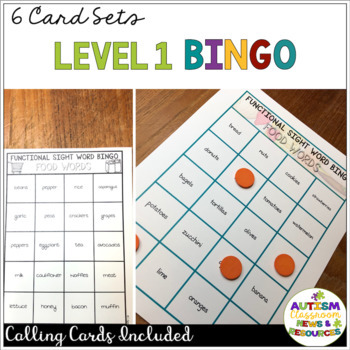 They are designed to teach students to hear the words and find the words, whether in a BINGO game or just for 1-1 practice. There are 2 levels of BINGO cards included. Each are included in color and black-and-white. There are 102 Words found in grocery stores, menus, and restaurants are included with some words repeated. Each set of cards has a different font to tell them apart. See the preview for a list of words included and examples.